On Wednesday 9.3 million high school graduates across China will spend their second day taking the national university exams known as the "gaokao," while the country's educators try to figure out why there are more than a million fewer students taking the tests than in 2008. There are more than 300,000 less students taking gaokao compared with last year's figure. The last year of high school is supposed to be full of high hopes and great plans for the future, but top-student Tu's excitement about graduating has been dampened since half of his classmates dropped out in the final months of school. Tu knows why most of his classmates left school in the final stretch after three years of hard studying. "They don't believe they have a chance of entering a good college, so they went looking for other opportunities," Tu said, asking that his full name not be used. Ranked among the top students at Xixian County No. 3 High School in Henan Province, Tu is also worried his score on the tests he is taking this week might not be good enough to get him into a college that's worth attending. National examinations are a long-held tradition in China. Passing them was a requirement for those who aspired to serve in the emperor's bureaucracy and since China's liberation passing the gaokao has been the only way to get into university. 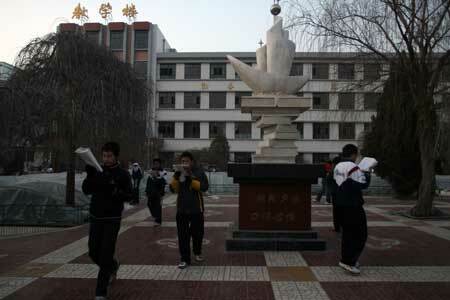 Some former students at Tu's high school have even taken the gaokao four or five times in the hope of raising their marks and meeting the higher standards required by better schools for students from Henan. An official report on higher education enrollment issued by Education Online, the biggest online education portal, this year indicates that the number of high school graduates who registered for gaokao peaked in 2008 at 10.5 million. This year that number has dropped by almost 1.2 million students. The number of high school students who were qualified to sit the exams but decided to skip them reached 840,000 in 2009. That number jumped to a million qualified new high school graduates skipping the gaokao in 2010. There are a number of obvious reasons for the declining number of students taking the exams. Demographics show the population of high school grads is in decline and will continue to drop until the turn of the decade. Increases in family incomes have not kept pace with rising education costs. The lack of equality of opportunity in education, especially for those from rural areas, has also emerged as a major factor. Perhaps the most troubling reason freshly-minted high school students are skipping university are the tales of hardship they've heard from those who have already obtained a post-secondary education. Their low pay and poor employment prospects indicate that the investment in time, effort and money required to earn a degree is not providing the promised dividends. Many high school students are seeing the writing on the wall and instead of pursuing a university education they're seeking training programs that will get them into the workforce as soon as possible. Five years ago, Wang Yajun failed to get into a key high school in Yongqing County in Hebei Province, where he was raised. Even as a young teenager he knew his chances of going to university were practically nil. He decided then to attend a vocational school and study accounting. "I knew I would not have a chance to get a good gaokao mark after attending an ordinary rural high school, so why waste three years for nothing?" he said. Nowadays a more diversified labor market requires more skilled technicians and fewer academics. This new reality is leading students to choose a course of study that is more practical and skill oriented. "I don't think the university courses are practical and enough to land a good job," said Wang. As Wang's peers were taking their first tentative steps at their new colleges and into an uncertain future, he had already landed two jobs in Beijing. Wang's younger cousin, Wang Guizhe, followed a different path after high school, but is now having second thoughts. The younger Wang was determined to get a higher education and took the gaokao. He ended up with high enough marks to get into a college in northern Jiangsu Province, where he is majoring in engineering. The exhilaration of leaving home for college didn't last long. Wang quickly learned that his job prospects after graduation are likely not that great. "I don't want to go back to my hometown after graduation. I want to go to southern Jiangsu Province because it's richer," the sophomore said. The cost of his annual education – 15,000 yuan ($2,315) a year – is a small fortune for his family and he's worried he won't be able to pay them back. "My parents' savings are enough to support me, but my dad raises pigs and his income is not always stable," he said. When Wang was a freshman he worked part time on campus but quit to devote more time to vocational training programs that will increase his employability after he finishes school. "I want to get some certificates before graduation. I've heard that graduates who don't have work experience or skills can't even compete with migrant workers on the job market." In the poor county of Huining in Gansu Province, passing the gaokao and going to university used to be seen as the best way out of poverty and the path to eventual fame and success. There was a time when local people only talked about two things: When was it going to rain and whose kids got into college. The long-held Confucian belief of "changing one's fate through education" seems to have backfired on many poor families in Gansu Province. The Southern Weekend reported that 50 percent of the peasant families that fell back into poverty cited education expenses as the main cause. Many are finding that after the rigors of the gaokao they enter college as proud freshmen, only to later end up in the workforce as deflated members of the so-called "Ant Tribe." They are the new educated youth, who, after graduation, head to the big cities with big dreams, only to find highly-demanding, poor paying jobs while living in cramped, shared housing. In his book Ant Tribes II published last year, Lian Si, wrote that 60 percent of the "ants" are from rural areas. Their education consumes their families' savings and after finishing school they're worked to exhaustion just to survive. The college enrollment rate of those who take the gaokao surged from 57 percent in 2008 to 72.3 percent in 2011. While they were encouraged to take courses offering better career prospects, the expansion of college enrollment has outstripped the needs of the labor market. Many grads are finding their majors have let them down and they have slipped to the bottom of the labor pool. "When people no longer see education as a tool to better their lives, they start to think education is useless," said Xiong Bingqi, vice director of the 21 Century Education Research Institute. Xiong believes society's attitude toward education has changed. "The quality of education rural students received when they were young is not as good as those who attended school in larger cities. 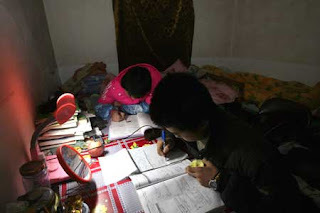 The rural kids are also disadvantaged when it comes to finding a job because their social networks are smaller and the limits imposed by their hukou (residence permit)," said Xiong. The unequal distribution of educational resources has led some experts to suggest that college education shouldn't be dangled like a carrot in front of rural students. "Once they go to college, they won't want to go back to their hometowns and they'll be stuck in cities where property is unaffordable. They will also no longer be part of the rural culture," Wang Ping, a member of the Chinese People's Political Consultative Conference, said in a panel discussion at this year's meetings. Xiong sees changing attitudes about higher education as a chance to return to the true nature of education, which is to help mould knowledgeable and creative minds. "In China, education has long been seen as a way of changing one's social status," said Xiong. "But we need better planning to differentiate liberal arts education from vocational education." Despite calls for reform, the gaokao exams are still seen by many as a fair, universal testing system that allows the truly meritorious to rise to the top regardless of their wealth or family background. This is why Tu's mother, Zhang, had enrolled Tu in a primary school in Beijing before sending him home to Henan Province to complete high school. A migrant worker in Beijing for more than a decade, the farmer-turned-domestic-worker told the Global Times reporter, "I want to send my son to the best university I can afford. If he gets into a good university he might become a civil servant some day."